“I didn’t talk much”, said Philip Cheah when asked about how he became hooked on cinema. This quiet Chinese boy, growing up in Singapore in the Seventies found his best means of experiencing other people, and learning about the world, in movies. When he was around thirteen years old his brother was working in the Twentieth Century Fox office. So Philip had a free pass to see any films that Fox distributed. When his brother left the job, Philip had to find another way to see films, so he attended screenings at the various Embassies in Singapore, the Alliance Francaise, and the British Council. In that era, he remembers seeing “Cabaret”, “The Culpepper Cattle Co”, and “Taxi Driver”, the latter heavily censored. “Actually, I saw the restored version of “Taxi Driver” this year at the Shanghai Film Festival, and I saw where Tarantino got his ideas from,” he commented. Philip still doesn’t talk much until you get to know him, and even then, he’s still ‘quiet’. However, he certainly knows his stuff when it comes to cinema, which has become his career, although he never studied it formally. He now works as an observer of South East Asian cinema, a critic, and film festival program consultant. He’s a good listener, and a sensitive man and he has applied his astute powers of observation and empathy to gain a deep understanding of the cinema of the region. He attends as many of the leading regional film festivals as he can and often sees value in such documentaries, as “Prison and Paradise”, (from Indonesia), that Western orientated professionals cannot identify with. He once wrote a very interesting essay on the problem of “cultural misunderstanding” that can occur when films travel from one culture travel to another, and saw “Prison and Paradise” and a classic example. His life in cinema began when he gave up on social work, soon after he graduated from university. He decided it was futile to try and change things in Singapore society, at the time under the iron grip of the late Lee Kwan Yew. However, when he did his two and a half years of military service he was assigned to a job as a counsellor. He later ended up in journalism and then in film reviewing, during an exciting time in South East Asia’s film history. It was the time of the Hong Kong, and Taiwanese ‘New Wave”. “Because of my standing as a film journalist, in 1985 Geoff Malone, (an Australian architect who had made his home in Singapore) enlisted me into a committee to plan an international film festival in Singapore. My first role was handling publicity, but then it expanded. The Mill Valley Film Festival of California, USA, gave us a framework for a successful festival, and the first event went ahead in 1987. “After the first year, I told Geoff that the festival had no local content or character, and that for the second year we had to find an Asian voice,” Philip explained. The Festival has survived until this year, although it ran into funding problems and wasn’t held in 2012/13. However Philip was one of three curators for 2014’s Southeast Asian Film Festival in Singapore. Philip Cheah considers that the two strongest national film industries in the ten nations that make up South East Asia, are first, The Philippines and second, Indonesia. Philip was called upon by the British Film Institute, to list his most admired documentary films, for the September 2014 issue of their “Sight and Sound” magazine devoted to ‘the greatest documentaries of all time’, with lists by leading world critics and film-makers. This is strong recognition for Philip’s reputation as commentator on South East Asian cinema, from one of the most respected and longest running film critique magazines in the world. Another of his projects is “The Big O Magazine” – Singapore’s only independent pop-culture voice to be found online. Asked to name some of his all-time favourite films, Philip first mentioned, Yasujiro Ozu’s “Tokyo Story”, “Aparajito” and “Charulata” by Satyajit Ray, of India, “A One and a Two” (Yi Yi) by Edward Yang of Taiwan, “Manila by Night”, by Ishmael Bernal, “15” by Roystan Tan (Singapore) and “Si Mamad” by Sjumandjaya of Indonesia. Regarding Indonesian films, he says that his favourite is Garin Nugroho’s “Opera Jawa” which he calls ‘a stand-out film’. Philip likes films with a balance of story and film-language. “The Buddhist middle path is the best,” he said. However, he also likes a film style that he calls “balanced extremity”, such as is demonstrated in “Apocalypse Now” or “A Clockwork Orange”. Philip was in Brisbane for ten days in October 2014, for his role as a member of the Nominations Council for the Asia Pacific Screen Awards, 2014 (APSA). He has been a member of the Nominations Council for seven out of the eight years of APSA’s history. 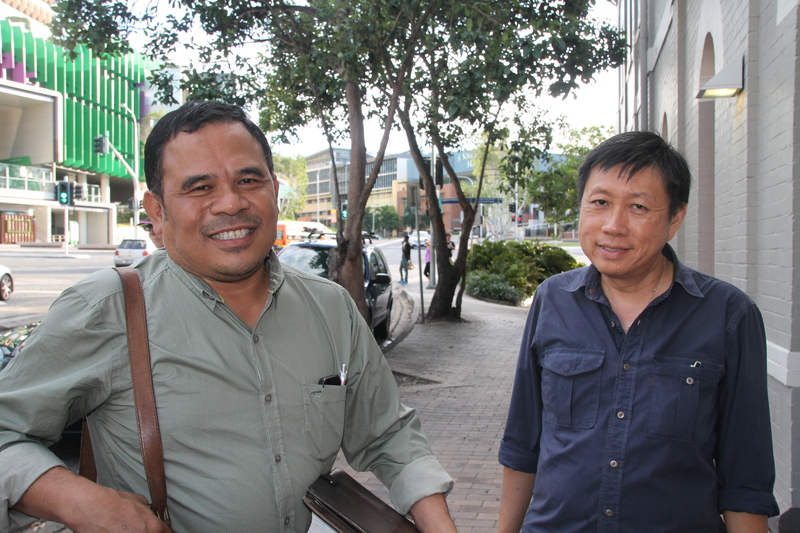 Philip Cheah has since returned to Brisbane in early March 2015, because of his role as curator of a mini film festival of the work of Garin Nugroho, Indonesia’s most internationally known filmmaker. The six films are Philip’s own favourites of Garin’s work and they also demonstrate Garin’s work as being a kind of cultural and historical record of Indonesia. Garin has worked on many far-flung locations within the enormous archipelago, and in a variety of ethnic cultures. Because of this he was chosen to give Master Classes to the senior students at Griffith University Film School, with a focus on pre-production and location shooting. Amongst Philip’s film related activities, he is the Vice-President of NETPAC (Network for the Promotion of Asian Cinema) and is therefore involved with Griffith University Film School’s new mentoring program, called Asia Pacific Screen Lab, which was launched in late 2014. (See the university website). He is Patron of the South-east Asian Screen Academy in Indonesia and is involved in the NETPAC-Yogya Film Festival, as Vice-President of the Network for the Promotion of Asian Cinema (NETPAC). He’s also a consultant for several Asian film festivals. He has received awards from Cinemanila International Film Festival, and from the Pusan International Film Festival, for his work in promoting Asian cinema. He has also co-edited several books on Indonesian, and Vietnamese cinema. Discussing the situation for contemporary filmmakers, Philip observed, “Now everything is moving too fast. You are supposed to become successful really quickly, but if you can’t keep up with the pace you are also forgotten really quickly. This is making it all the more difficult. This fast pace and massive volume of everything coming at us all the time is the real weapon of mass distraction, “he said. Hi there! Just wanted to mention that I managed to get my hands on a copy of the book you recommended, The Story of Film. It’s a great read so far, cheers! At the same time I wanted to nominate your blog for the versatile blogger award, please don’t feel obliged! By the way, my local library (and therefore, perhaps yours too) has the DVDs. The series was broadcast on SBS a couple of years ago! May 8th 2015 -I don’t know about “the versatile blogger” award, but it sounds like a compliment. I’m new to this game. By the way, I hope you received my message, that SBS were screening the entire series by Mark Cousins, during the last few weeks. It’s all there now, on SBS on Demand! hi! It’s okay, the Versatile Blogger award is a compliment, and its also a way of connecting blogs, but don’t feel obliged! Do I need to do anything, re “versatile blogger”? I’m so glad you’re watching Mark Cousins’ program. I think it’s the only truly international overview of the history of “WORLD” cinema. You can write a similar post, but you don’t have you.